Enjoy live entertainment and great views, every Saturday March through November. $5 cover charge. The Bank Bar offers a fun and informative libation class every second Thursday of the month. This month's class features "The Classic Cocktail," with tastings, a history lesson, mixology tips and food pairings. Class size is limited, reservations recommended. Call 573-486-1010. 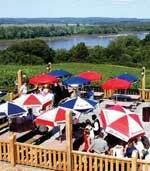 Enjoy live entertainment and great views at OakGlenn Winery, every Sunday, April through November. No cover charge. This month's class features the artisan range of spirits from Payne & Coulter Farm Distillery for sampling and a few creative cocktails. Class size is limited, reservations highly recommended. Call 573-486-1010. The Bank Bar on Schiller Street offers two fun and informative libation classes every Saturday afternoon. Martini 101 meets from 2:00 to 3:00 p.m. Whiskey vs. Whisky meets from 4:00 to 5:00 p.m. Class size is limited, reservations are recommended. Call 573-486-1010. The Bank Bar offers a fun and informative libation class every second Thursday of the month. This month's class explores the use of fresh herbs and other garden bounty in cocktails. Class size is limited, reservations recommended. Call 573-486-1010. Enjoy an evening of live music, food and drink at Riverfront Park the second Friday of every month. Sponsored by the City of Hermann and the Hermann Arts Council. Even Steven, Saturday & Sunday, 1:00 to 5:00 p.m. The East Central College Jazz Band, under the direction of Aaron Bounds, and the JB Big Band, under the direction of John Berkemeyer, are joining together once again for a great evening of jazz music! Come and enjoy listening to jazz classics! The event is free of charge. Additional information is available at www.HermannARTS.com.